Blackjack is one of the biggest casino games in the world. Australians play the game and learn the rules in just a few minutes. Since it can take years to master we cut through the complications to give you a clear concise guide to blackjack and other 21 variants. 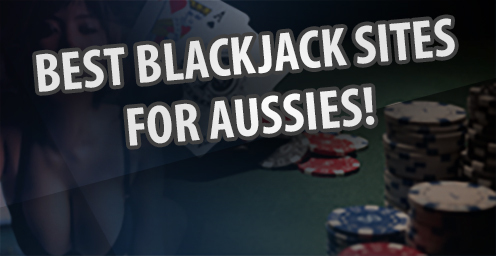 For our international readers only (online casinos are banned in Australia as of September 2017), we also take a look at online blackjack and where international players can try real money games. This site will provide rules of games, diverse strategies, where Aussies can play, and the different games, you should find everything you need to know about this thoroughly enjoyable game right here. After extensive research, we’ve compiled a list of the best Internet casinos offering diverse and high-quality online blackjack on computer, laptop, smartphone and tablets – all with the best odds and rule-sets. 1/ Gday Casino: G’day online has over 20 blackjack variants available from NetEnt, BetSoft, and since 2016 Felt Gaming. The latter provider offers standard gameplay with the addition of unique side bets, including Perfect Pairs, 21+3 and more. Play the Lucky Lucky variant from Felt’s range as the side bet offers the best house edge of 3.95% – the base game on all variants has a house edge of 0.95%.You will also find a range of NetEnt and Ezugi live dealer blackjack tables. 2/ All Slots Casino: Opened in 2000 and a long-trusted operator under the Brightshare banner, All Slots isn’t just for pokies – it has a superb catalogue of blackjack and one of the most newbie-friendly, slick casino interfaces on the Web. You can download the Microgaming casino or play blackjack via your browser – we recommend Microgaming’s Classic Blackjack with perfect basic strategy play to get the house edge down to 0.13%. 3/ Guts Casino: Players will find 20 blackjack variants by the best software developers in the industry, including Microgaming, BetSoft, Net Ent and more. Don’t get the Pontoon variants available at Guts casino mixed up with what you may find in Australian land-based casinos – the latter variant is more akin to Spanish 21. 4/ Royal Vegas Casino: Founded in 2000 the leading site of the ‘Fortune Lounge’ group of casino websites, Royal Vegas is our recommended favourite for its range of online blackjack on offer – classic, high-stakes, live dealer, multihand, re-deal – along with generous deposit bonuses to get the most out of every dealt hand. Use the handy search filter via the Flash version to view the 27 instant play blackjack titles. 5/ Jackpot City Casino: Established circa 1998 and is one of the oldest and most experienced Web casinos, Jackpot City lives up to its name and hosts an impressive range of Instant Play and downloadable Microgaming blackjack games with a number of stakes options. If you’re trying to clear the wagering requirements at the web casino for promotions avoid Classic Blackjack as bets on the title only contributes 2%, while all other blackjacks contribute 10% to the turnover amount. Real money blackjack at these sites can be played on your computer, laptop, mobile and tablet. If you’re looking to play on portable devices, click the buttons below on your device to load up your chosen casino site. Whether you’re a beginner or a seasoned veteran, the following blackjack tips should serve you well online and at land-based casinos. The team at BlackjackTips.com.au are experienced in all things 21 and love passing on the knowledge they have gathered over the years. Learn basic strategy: This is the most important tip to take to the tables as it can decrease the house edge giving you a better chance at winning. The basic strategy is a chart which tells you how to proceed based on the two cards held by you and the dealer’s up card and is the foundation for a successful blackjack career. The chart relies on statistics and gives you the best possible outcome – not a guaranteed win. You need to find the correct chart too – this depends on the rules, how many decks are in play and whether the dealer Stands on Soft 17s – so be sure to look up the appropriate rules. It will then tell you when to Hit, Stand, and Double Down. Avoid insurance: This is a side bet designed to take advantage of inexperienced players. Sure, you recoup some money if the dealer hits blackjack, but the odds are against you. The house edge for an eight deck blackjack game – the most common number of decks in play – is 7.47%. If one deck is in play – you may want to consider it as the house edge is below 3% but all other times its advised to pass for new blackjack players. Experienced card counters may utilise this side bet, as they can better calculate the dealer’s chances of getting blackjack on any given hand. Splitting: You can learn these by summarising the basic blackjack chart and should be important points to memorise. You should always split Aces and Eights, but never split Fours, Fives or Tens (or face cards). All other pairs should be split when the dealer shows a six or something lower on his/her up-card. Learn the rules: This may sound like common knowledge but there’s a huge range of variants available – especially online – and even if a game says ‘Classic Blackjack’ it might have different rules than you are use to. You can always look up the rules online via the game screen of the Internet blackjack game or read the signs at land-based casinos. Only play at secure casinos: Online gaming is quite beneficial – you can play at your own pace, there’s lower minimums available and you can learn the basic strategy correctly – but it is important to only play at secure sites. The casinos listed above have all their blackjack games tested by third parties to ensure their games are fair. So if you’re sceptical click on the eCOGRA logo at the bottom of these sites to view the payout rates of the blackjack games. Play live dealer casino games: If you prefer a land-based casino experience but can’t get to one easily you can find the same ambience online via live dealer games. Our recommended online casinos offer live dealer games where a croupier is streamed in real time from a studio or land-based casino and will deal the cards to a real table – you can place your bets via a digital interface. You can chat to the dealer and other players too via a chat box on most live dealer blackjack games. Never bet more than you can afford to lose: A losing streak can make topping up our Internet casino account quite tempting – and it can be easy if using a credit or debit card. Opt for an e-Wallet if you’re likely to be tempted as you can store limited amounts in the web wallet and once you run out you will have to go and top it up in order to make a deposit at the online casino. This will give you some time to revaluate things in the same way ATMs are hidden at land-based casinos to give you a moment to think. Practice makes perfect: Before you start playing for real at an online or land-based casino, practice with your mates and become familiar with the rules of the game. Or play for free at one of our suggested sites to improve your skills. If you encounter something you don’t understand, read more about it, and that’s what we are here for. Also, if you’re planning on learning how to count cards, this requires countless hours of practice before you can accurately keep track of the deck. Don’t drink too much: This applies to brick and mortar casinos, but also when playing from home. Some land-based casinos provide free alcohol; a sure way to get patrons drunk and possibly cause them to abandon or forget their gaming strategies. Australians have a number of options available to deposit real money into a casino account. There are no restrictions placed on how we can deposit, though, Paypal has stopped its Aussie services from depositing into online casino accounts – so its best to avoid looking for a site accepting Paypal. Some of the more common ways to deposit money into a casino is via credit card (Visa, MasterCard etc), web wallets (Neteller and Skrill), and bank transfers, which is a great method for players looking to deposit large amounts of money. All the common ways of depositing, barring a bank transfer, are generally instant methods. This means you can sign up at an online casino and minutes later be playing. Withdrawals will take longer at online casinos with most taking between 24 and 48 hours to hit the players account, after they request the withdrawal. With all that said, we cordially invite you to navigate through the rest of our website. We’ve made an effort to include the best advice and recommendations on a wide range of blackjack subjects and are confident you will take away a good amount of knowledge so you can hone your skills at this great game.